Mature face pleasantly talking on mobile phone. Close up portrait of smiling mature man face talking on cellphone, green hroma background. 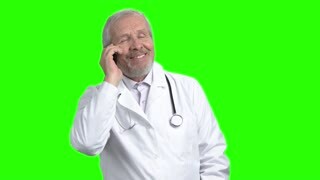 Happy doctor with smartphone, grey background. Smiling senior doctor using his touch screen phone, portrait. Smiling face of elderly doctor. Old physician talking on phone portrait. Smiling doctor speaking. Green screen hromakey background for keying. Old businessman talking on phone. 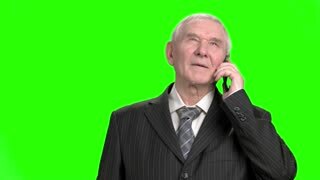 Portrait of senior businessman in suit talking on phone, green hroma screen background. Smiling old doctor checking your lungs. Portrait of old cheerful doctor holding stethoscope, green hroma background.